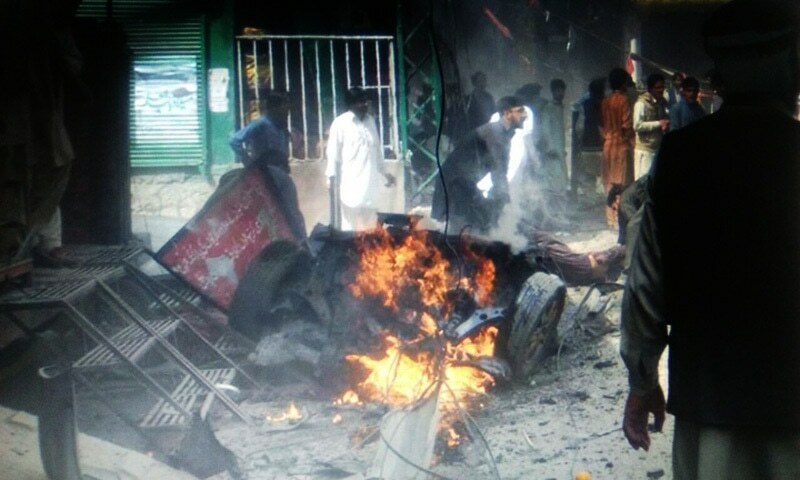 A blast outside an imambargah at a market in Parachinar killed at least 22 people and wounded 50 others, hospital sources told DawnNews on Friday. “We have 22 dead bodies here at the hospital and 57 injured, including women and children,” said Moeen Begum, a surgeon at the hospital. 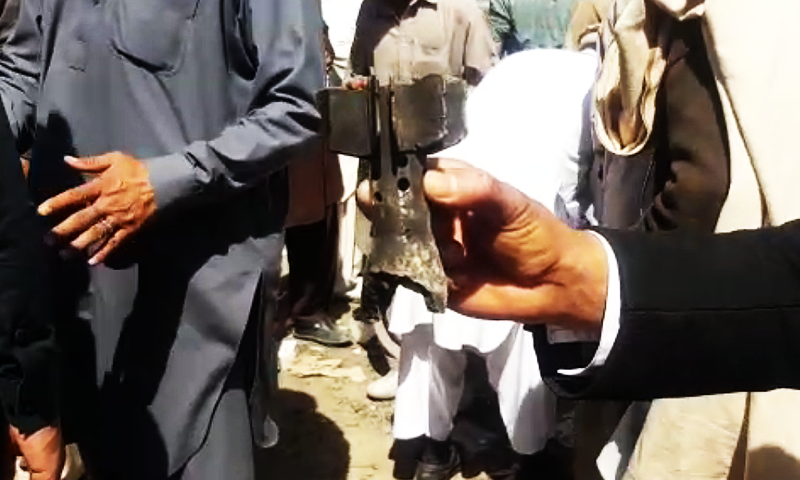 Ikramullah Khan, the local political agent, confirmed the death toll of the blast that took place this morning in the crowded Noor market. A parliamentarian from Parachinar, Sajid Hussain, told Reuters it was a suicide attack and was preceded by gunfire. “The attack took place in a busy area and a women's mosque appears to be the target,” he said. A banned outfit Jamat-ul-Ahrar through a video message claimed responsibility for the attack. The marketplace is a busy area and has several shops. It is also near one of the main imambargahs. Firing was also reported in the area before the blast occurred. 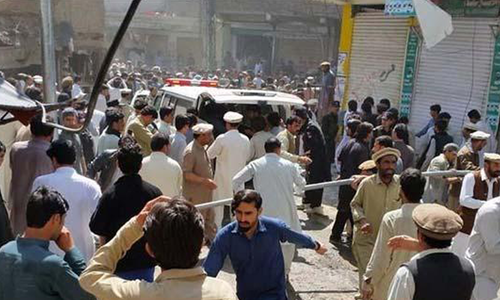 Government administrator Zahid Hussain says authorities are transporting the dead and wounded to nearby hospitals. Security forces have cordoned off the area. The political administration has declared emergency at all hospitals in the area. An Army medical evacuation helicopter has also been flown to Parachinar for evacuation of the injured, an Inter-Services Public Relations (ISPR) statement said. Mumtaz Hussain, a doctor at the local Agency Headquarters Hospital, told Reuters five bodies, including a woman and two children, and more than three dozen wounded had been brought to the hospital and an appeal had been issued for blood donors. “Patients are being brought to us in private cars and ambulances and we have received over three dozen patients so far,” Hussain told Reuters. The attack is reminiscent of a bombing at a market place early this year, which resulted in the death over at least 25 people. The January attack was claimed by Lashkar-i-Jhangvi al-Alami along with Tehreek-i-Taliban Pakistan (TTP) splinter Shehryar Mehsud. The army had launched Operation Raddul Fasaad last month following a spate of terror attacks in the country, which claimed more than a hundred lives and left hundreds others injured. The operation seeks to eliminate the "residual/latent threat of terrorism", consolidating the gains made in other military operations, and further ensuring the security of Pakistan's borders. 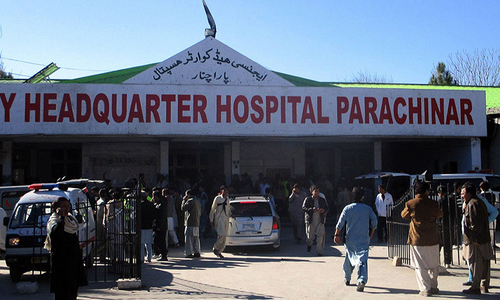 Parachinar is 250 kilometres west of Peshawar and has a population of 50,000. In the wake of sectarian clashes in 2007 army and paramilitary forces set up several checkpoints on roads leading to the town. 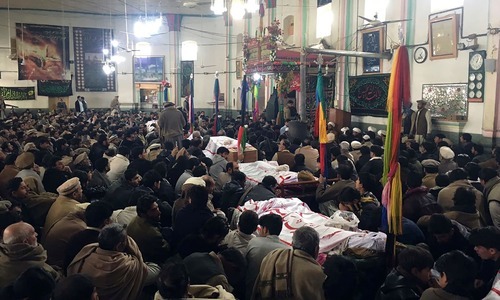 Kurram, the tribal region of which Parachinar is the main town, the only part of Pakistan's border region that has a significant Shia population, has been racked by sectarian violence. Prime Minister Nawaz Sharif condemned the attack and said the government would keep up efforts to “eliminate the menace of terrorism”. "The network of terrorists has already been broken and it is our national duty to continue this war until the complete annihilation of the scourge of terrorism from our soil," he said in a statement. Pakistan Tehreek-i-Insaf (PTI) chief Imran Khan took to twitter to condemn the blast. 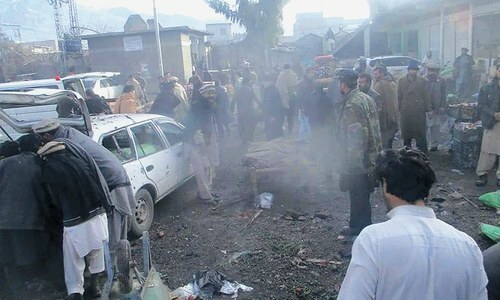 "(I) strongly condemn (the) blast in Parachinar, targeting innocent people," he said on twitter. Khyber Pakhtunkhwa chief minister must ensure availability of all medical facilities on emergency basis, he added. No, not again, it is getting out of hand in Pakistan. Seal the border completely and only those should be allowed to travel with valid visa, and then we can think of peace otherwise big NO. Close the border with Afghanistan again. Cowards do not have guts to face Pak army rather attack innocent civilians. RIP those who died. My condolences to the injured and to the families of the deceased. Feels sorry guys... I'm from India and every time I see such incidents anywhere around the world, my heart bleeds. Instead of repetitive talks and drama quotes, Pakistan must concentrate on eradicating Terrorism soon...There are no such thing as good terrorists or bad terrorists..
again a very tragic incident. Why this Blasts happen mostly on Fridays? One more. When will this end? May god give strength to the relatives of the ones who lost their lives. Condolences from across the border. Innocent lives lost.. Sheer madness. May the departed soul rest in peace. Should have kept the Afghan border closed. Opening it was a mistake. What a sad state of pakistan. This is an inter-sect war like the one, that is ravaging Iraq and Syria. We must tackle the bull from its horns much earlier than its horrors assume catastrophic proportions. It needs actions on highest levels and high level clerics of the faiths need to be taken onboard the corrective measures. Please close the border with Afghanistan for the foolproof security and safety of Pakistani nation. We will "Never" surrender ! Pakistan Zindabad ! There you go again. I don't know why Nawaz Sharif ordered the opening of pak-afghan gate. That should be closed and closed forever. The politicians are not serious about killing the terrorist scourge in Pakistan. Another day ... Another Blast ... What a pathetic performance governing bodies. so sad.when will this madness stop.and also the stupid call for closing borders . Closing the border with afghanistan alone will not do it. We have a radicalised population in which jihadis are produced from madrassahs, first fix the internal matters. Fighting alone will not do anything unless these social problems are fixed. Why u sealed the border if u had to open it again and again. A few more statements of condemnation from the stack holders and life will go on. That is how we have been living God knows for how long. For God's sake this is not the way to deal with these monsters. Cut ties with AFGHANISTAN by sealing the border and then go and kill these monsters hiding there to target our mother land. Government of pakistan is responsible for this blast. They orderd to open the border with Afghanistan again. These kind of attacks were already written. Parachinar has been suffering from sectarian terrorism for years. Pakistan joining some Military alliance in the Middle-East is only going to aggravate such attacks which is going to destroy the social harmony among the people. Now there is sharp clarity between close and open borders with Afghanistan, no incident took place when border was closed now only few days of opening this happened. For Lord's sake, close the border with Afghanistan. We may lose some trade money but will save a lot of Pakistani lives. Start fencing of border too and deploy drones and jets on Afghan border and kill anyone who tries to enter illegally. What is new? All tall security claims are thrown in gutter again, again, and again. We feel sad and then forget. Its heartening to hear innocent women. Children are targets of terrorist .whats the vigilance is doing? Sad, very sad, innocent people being killed.. It will continue till we keep dividing people in the name of race, religion & ethnicity. It will continue till we use violence as means to overcome issues than love and affection. Hold on friends. This is what we, our officers and politicians have given to our country. No point in discussing now. We are paying for all our mistakes. 'Close the border' is the solution most of the people proposing. But the enemy is within. It is a complicated war that will not be won by crushing the terrorists and their bases but by changing the mindset. You kill x number of terrorists and then there are x number of terrorists produced by the certain schools of thoughts. Itz true that militants may not be using the formal route of border but sympathesizers, planners, financiers do cross the formal route of border and they are the backbone of these terror attacks. very unfortunate. My heart goes out to those affected by the blast and their families. I hope the defence military establishment realize the pain and agony among hapless people and takes action against extremists and militants of all sorts, regardless of their origin and political affiliation. Good and bad terrorists policy ! What a shame ! Just a brief respite of peace and then there is an explosion which killed innocent people. When this kind of violence will end in Pakistan? My condolences to the families of the deceased. RIP to victims. Feels that some one lost from the family. Very bad. Can't figure out words to explain the grieve. So sad...... we should accelerate our efforts to root out this menace from our country. One more attack. One more case of innumerable innocent lives lost. One more round of condemnation. One more 'we'll-eliminate-terrorism' rhetoric. And the story goes on...and on. Pakistan should immediately declare emergency and destroy the very foundation of terrorism (good, bad & ugly). And let this emergency continue for six months. It's time the people of Pakistan say, "this far and no further". remain consistent with the crackdown guys. these terrorists are gasping and can now only target the innocents, as the government institutions seem to be getting difficult to aim. when boys will understand that good and bad terrorists game will not work. Pakistani people should put pressure on govt to punish all terrorists; be it taliban or LeT. Everytine the government and army says that we have control and there goes another attack ! Can you guys stop your lies ! For all the citizens Advanced RIP if you don't raise voice against terrorism...Sorry to say but people has to woke up & get a real freedom from such things. Feel so sorry for the victims. One attack in UK a few days ago wherein 5 people died had the world shaken. Now 22 lives are lost and the world takes this more or less in the stride. Whats happening? Have we taken for granted that lives are cheap in the sub-continent? Time to have cooperation among India-Pakistan-Afghanistan to weed out and terminate terrorists. We say RIP to the victims but they cant really rest till the menace of terrorism and hatred for other religions are eliminated. RIP, all forms of terrorism must be defeated. May their Souls rest in peace. This should stop. We have seen enough of it now. Be it India or Pakistan, every life lost to terrorism is a slap on our faces. One crazy terrorist kills many and so much of people like us cant do anything. We should stand by our Govt if it takes strictest of action in order to curb terrorism. So sad! Our Security forces have work truly to eradicate the menace of terrorism.We all(Political parties, religious parties, secular parties and others) have to amalgamate against terrorists. And also, we all muslims should Act like parts of one body. Inshallah We will be herculean against terrorism. The very coalition that Pakistan has joined in Saudi Arabia is responsible for terrorism in Pakistan. @khem No not really. We are close enough to finish this menace. Thanks for you support. Terrorism anywhere, by anybody and in any form is condemn-able. Hope the government of Pakistan will wakeup and eliminate all terrorists without differentiating good and bad. Nawaz Shareef must take the responsibility of this and resign. He is the one who allowed the border to open despite strong security concerns originating from Afghan soil. @Sympathiser It is like chopping few branches of a tree. Until you completely destroy the root (cause) you will not succeed. No matter how many thousands of terrorists you manage to kill. Congratulations Choudhry Nisar & Rana Sanaullah for not implementing NAP & for not activating NECTA & for patronizing Lal Masjid and terrorists of South Punjab. So opening up border to Afghanistan was whose idea? PM? Sealing borders would only work when we have put our house in order first. The extremist groups are conveniently messing around right under our nose and getting support & protection from within. @Rajeev ....this is not matter of good or bad terrorist. This act of mukti bahni. it is CPEC centric, and perpetrators will be paid back soon. Ohh god, what do they want!!!!! Please stop this. For how long this killing will continue. God please have mercy on us. now N.S will order stopping of border management. RIP. Its sad. So many families quietly living their daily lives got shattered completelt unknowlingly by act of a bomb. its very difficult to stop suicide attack. if someone has decided to die harming innocent unarmed dont know how you reason with him. i dont know how and where it all started to eradicate terrorism you need to attack this ideology of suicide attack. religious preachers should educate that its a cowardly act. Stop Madrasa education for a decade and you will have fine young men from then on , no point beating around the bush , try to confront the enemy inside. This madness will continue until we stop the distinguish between good terrorist & bad terrorist . They are terrorist & this cost human life. Life of Pakistani is equal precious like that of Afgan or Indian . Pakistan, pls act against all terrorists without distinction. Even 1 terrorist left, whether good or bad, will foil all efforts to eradicate this menace. Our hearts cry when we wake up in the morning and read about so many families destroyed by these monsters. -A Bharatiya. @A friend from India, you are a good exception. if all Indians join you and ask the government to see what the majority wants, all problems would soon become history. See where India and Pakistan had reached in Agra Summit and start from that point onwards. Use high tech video sand audio technology to find and eliminate these terrorists. They live among you. Change your war technique. Come up with more sophisticated methods in tracing these cancer cells in the country. RIP. Yesterday PCB chairman has said that all matches of PSL 2017 will be played in Pakistan and today we have bomb blast in Parachanar. I hope it is last attack. pak army will clean all terrorists anywhere they are. Condolences for the innocent people who lost their lives . My condolences to the bereaved family. There is no good militants, all killers are bad. Denounce and isolate them. Thank you nawaz shariff for Reopening borders!!! however , all we got was stab in the back in form of kargil war . Change the Interior Minister immediately, who has soft corner towards extremists. My Heartfelt condolence for the Families. Nawaz Sharif should resign immediately as he is the one who ordered to open Afghan borders. Thank you so much our brother Islami mumaliks. When are we going to accept the fact that none of the so-called "Brotheer Islami Mumaliks" are Pakistan's friend. They are friends of corrupt elites of Pakistan and the kind of mess Pakistan is in, credit directly goes to these so-called brothers and the corrupt elites of Pakistan. What is the solution to stop terrorism and killing of women and children? @seeker oh yes we all people of India-pakistan-Afghanistan are all cannon fodders.If you see all incidents more than 90 % incidents involves common man.There is no value for human lives in our part of the world.If our so called leaders/Army do not get together or atleast have a broad based understanding to control this situation,sooner rather than later our region we will become next Syria/Iraq. There have been few days since the border opened with Afghanistan and there is another attack . fencing and regulating border should be the first priority . RIP innocent victims . When these outfits are banned, then how can they be active? And what kind of God has given them the right to kill those who do not prescribe to their philosophy? Which, to say mildly, is itself a deviant one. Rest In Peace for all victims , courage to injured and all people effected with the nasty Blast . What do they get by killing people; After all, all are children of God. It is so sad that for the past one and half decade innocent people die on the streets and Bazzars. It shows we have miserably failed to stop terrorism. Don't blame others. Mindset needs to change within Pakistan. This sort of mentality and violence will continue for years and years until and unless all the thousands of madrassas teaching a radical version are shut down. I am sorry and saddened at the same time to say that this is just glimpse of what is coming to my homeland if she joins military alliance with KSA.We should stay away from both Iran and KSA;they are top financers of extremism in the world.They both utilise popular dissent in their sects against others to belittle them. @Rajeev We both are hurting each other. Next time you will other bad things will happen in Afghanistan or India. This violence needs to end as only innocent are targeted for mass causalities and spread fear. Heartly condolence to the bereaved families of deceased. In fact no word will be sufficient to express our inability to eradicate this problem. When will we wake up. May God help us in facing this trauma. Human life has become cheaper than cattle. Devils are committing these type of atrocities at their whims and fancies. very sad incident...RIP victims....This is a much bigger challenge for Pakistan- How to get rid of terrorism? There is not short cut and has to be a long process. Along with launching military operation, they also need to target the root cause- How these young minds get radicalized? Who target them? Stop that, and in next 10 years, you will see better security situation. Very sorry to hear about this heinous act by cowards. DONT HAND EVERYTHING TO ARMY,WHAT IS THE PURPOSE OF POLICE THEN???? Pakistan have to start acting on this anti social elements without differentiating it as good and bad. I am sorry to hear about this innocent loss of lives. RIP. Border is open again by Govt..
@Indian true friend of beloved pakistan Devils for this one are in India dost, and soon when bad things happens in India or Afghanistan the devils for that will be in Pakistan. Thank you for prayers, I feel hurt also when I see something bad happening in India yaar. We are strong together a force the extremist in both nations don't want us to become. Message of peace, this is the only way out. Love is the greatest healing energy baba said long time ago, we don't listen to the our fakirs because they look to poor in their appearance, if we only see how rich their soul is. @IMTIAZ ALI KHAN , Your words are always very wise; You must be following Sufism. May God bless you. I hope the authorities catch the criminals and bring them to justice. I don't understand how can we become so helpless, our innocent people are dying everyday and our government is still unwilling to control the situation. This is a kind of sectarian attack its perpetrators and accomplices are present among us and now we cannot bear these miscreants anymore. The government should now take stern action against any such person who are doing us this trouble and against the people who are inciting and encouraging for such heinous crimes . We should not sympathies with these people any more as these are not human and they do not respect human life. RIP to victims. @IMTIAZ ALI KHAN WHAT A NOBLE SOUL YOU ARE ! @M.Saeed Clerix must not be taken on board. They must be taken out first, then humanity will survive. Mosque and Imam Bargah, close to each other, since a century should be shifted from market place after consulting stake holders. Seal the Border like India is closing your border. Prayers for the innocent bereaved families! Irrespective of our geographical/political/ideological status, we all must stand together to oppose, fight, and eradicate all forms of hatred. Kargil war happened before Agra summmit. I think you meant Lahore Summit. Get their handlers , get those who finance them. They can't operate without some one giving them financial support. Only solution complete cooperation between Pakistan and Afghanistan , no third country involved. Very sad. The military operation has proved unsuccessful in the elimination of terrorism in Pakistan. My heart feels the pain of the dead and injured. Hopefully one day Pakistan will wake up and deal with this menace. Until then people will have to deal with this brutality of these of these savages.Pakistan should abandon this ideology, which they fostered so long. Be patient dear citizens of Pakistan your government will wake up one day. Hopefully that wont be too late. Lament the lost souls. Leaders please don't tell us it is all under control. What's wrong with these people's psyche so that killing has become second nature? Who nurtured thes heartless savage killers to become who they are? A society can look through the window or a mirror to look for an answer. Country and society has two choices, regress to Stone Age or travel in the future to uplift the country and her people. Here we go again! These incidents are reminders of the fact that the fight against terrorism is not over and government should not start taking credit if there is no incident for a few weeks or months or even years. Terrorists should be eliminated once and for all. The problem is Pakistani people won't force the government to act. They just sit in their houses and send condolence messages. Why not seal the Borders, where all the threats are coming. Its time to give a reply to the aggression. Now who is behind this should be punished. We never eliminated root cause...and i hope we will never do same and keep suffering...What an agony we know and do something,human life no value here..
@The end is near We can barely keep our head above the water, no amount of security can stop this menace of terrorism because it is home grown. @rishi who are the terrorists and who are the innocents? @abe : 20 OR 22! Nation needs mental health services urgently.